Marcus Botbol was born in the northwestern Moroccan city of Meknes in 1957. At the age of seven, his family immigrated to Israel and settled in Ramla, a city with century-old links to the ancient past and a thriving bustling presence. The multi-ethnic character of the city’s population lends to the city and its environs a kaleidoscopic aspect, and it is this colorful mosaic, which has evidently been the major source of Botbol’s creative material and inspiration. Marcus Botbol showed evidence of artistic leanings at an early age, and to a large extent is self-taught. It was only in recent years that he felt the need to enhance his techniques and knowledge of the media, which he accomplished studying under the well-known Israeli painter Moshe Gat. The obvious mastery in the use of color as well as his well-defined sense of composition signifies Marcus’s originality and creative independence. 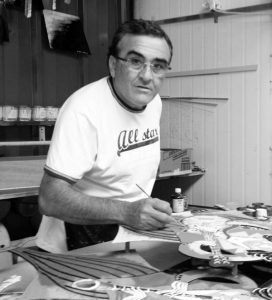 His work is expressive, which stems from an acute interpretation of the scenes and bustles of everyday life. As found in any accomplished artist’s life, Marcus too has developed his creative skills and unique expertise for compositional harmony over the years. From his painting series portraying contemporary crowds, surrounding vendors in outdoor markets or delightful little cafes set in a sun-drenched background of the white cubic forms of the small compact Mediterranean building, to his painting series of performing musicians, Botbol is currently working on wall sculptures based on his recent series of cubist painting. 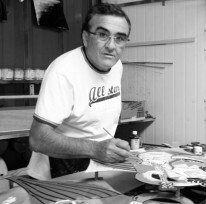 To achieve this, he has developed a unique technique of converting these paintings into three-dimensional, aluminum wall sculptures, painted in a vibrant double-layered metal acrylic color pallet and coated in varnish, which successfully enhance the colorful composition and portray the vitality of his painted figures.